Chris Wilder has urged the Cobblers supporters to recreate the atmosphere they generated for the visits of Oxford United when he takes charge of his first home game tomorrow. Wilder is well acquainted with the away dug-out at Sixfields, having sat in it three times when in charge of the Us. Those three visits were all characterised by two things - vociferous support for both sides and single-goal winning margins for Northampton. While Plymouth will not bring the same level of support that Oxford, who are Town’s nearest league two rivals in geographical terms, do, a healthy crowd is still expected. 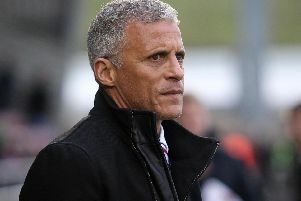 The home fans will be hoping to see the start of a new chapter in what has been a dire season so far, with renewed confidence among the paying punters that Wilder, who has signed five new players, can lift the team off the bottom of the Football League. And the new boss has promised to give the long-suffering Sixfields faithful plenty to shout about in his maiden home outing. “I don’t think I’ve ever got a result here,” said Wilder, whose first game in charge of the Cobblers ended in a 1-1 draw at Cheltenham. “I’ve been here a few times and there has always been a good crowd here. “My previous club would always bring a good following here because of the proximity and there was always a terrific atmosphere for those games. “The home support, whenever I have brought a team here, have really got behind the home team and they never seemed to be a crowd that went in for negativity. “That’s what we need and I know it’s difficult for a manager to ask for that after what the fans have had to put up with this season. “But this is a time for everybody to come together. The players have to start it off and give the supporters something to shout about and we’ll be doing that.